Well January has come to an end and I just managed to finish my final figures on Saturday. My four mounted Brethren are painted , based and varnished. So 2VPs to me. 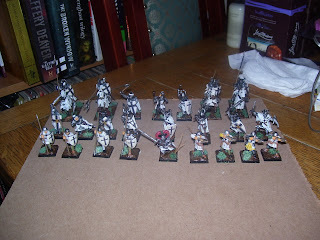 February's project is the 15mm Colonial British for our game of Space 1889: Soldiers Companion. Ruarigh is providing the opposition in the form of the martians. Hopefully I should have apicture of those for tomorrow. I should make a good start on these, as I am working away for two nights and will be packing my painting kit. Unfortunately I also have to drive past Caliver Books, so there may be some expenditure this week. That's if it is safe to travel with the snow and more forecast.